We only have one night this week to come out and drink at the Wine Bar and then we close until the weekend after Christmas and we have already SOLD OUT the vintage burgundy tasting and are almost ½ sold out for our Big Ballers New Year’s Eve party! Check out the line-up we are starting with for New Years even we start the night off with a 6-liter bottle of 1995 Dom Perignon and everything else we’re opening is out of 3 liter format or larger!! Only one seating and you can stay all night and party the table is yours for the night!! We have a lot of good customers here at the Wine Watch and at one time the #1 customer was #13 for the Miami Dolphins and we were happy to be one of his first customers when he and fellow quarterback Damon Huard partnered up to make wines in Washington State under the Passing Time label. Dan stopped by the store recently to taste us on all the new wines from the 2015 vintage of Passing Time, they now make three different Cabernet Sauvignons and an entry level blend that is a mix of all the great vineyard sites they source grapes from. The three single vineyards are all Most Excellent but the real deal for me was the new Columbia Valley Red blend at around $50 per bottle it is more accessible than the single appellation Cabernet Sauvignons and of course a better value. The newly released 2015 Horse Heaven Hills is as good as any wine they have made to date at Passing Time and now that they have enough wine to go around Damon and Dan are planning their first release party in South Florida at Hard Rock Stadium on February 16th to showcase the upcoming 2016 vintage wines. This is an invite only party and you have to be on the list at Wine Watch or Passing Time to get in and the purchase of 1cs of Passing Time wine will get you a ticket from Wine Watch but we only have 10 spaces available so don’t wait to long to respond to this offering if you want to meet Damon and Dan and be the first in South Florida to taste the 2016 vintage wines. Aromas of blueberry, black currant, cocoa nibs, with red cherry, violets, grilled bread, and pencil shaving notes. This wine has a linear focus and long finish, revisiting the creme de cassis, roasted cocoa, anise aspects, with a nice grip of fine tannins to give it the structure for the cellar. Delicious now, or cellar 7-10 years. The base 2015 Columbia Valley Red Cuvee is a blend of 92% Cabernet Sauvignon, and 8% Merlot. It offers gorgeous notes of creme de cassis, blackberry, dried earth, spice, and chocolate, with beautifully integrated oak. Rich, full-bodied, pure and elegant, its's one hell of an entry level cuvee. 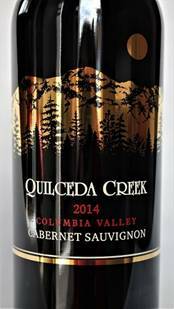 Revealing aromas of crushed cassis, tobacco leaf and creamy new oak, the 2015 Columbia Valley Red Wine is a rich, medium to full-bodied wine with a good core of fruit and a chewy but ripe chassis of structuring tannins that avoids excess. Cellar this hearty blend of 92% Cabernet Sauvignon and 8% Merlot for a couple of years and follow it for the next decade. Made from 100% Cabernet Sauvignon from a mix of Seven Hills and Pepper Bridge vineyards, the 2015 Walla Walla Valley Cabernet Sauvignon is backwards and brooding, with deep, black fruits, tobacco and graphite aromatics, full-bodied richness, a structured, concentrated profile and terrific length. The tannin is ripe and polished, but there’s enough to warrant short term cellaring. 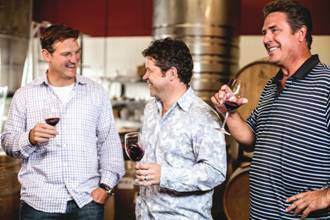 There seems to be a connection to the Washington State wine industry and NFL Quarterbacks as there are now at least three that are in the wine business in one of the best regions in the United States of American for Bordeaux varietals. 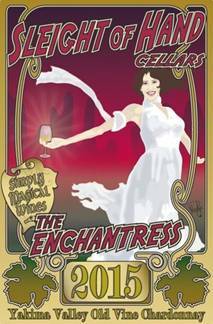 Over the last few years I have discovered a number of incredible wines from Washington State by traveling to Washington’s wine country to see what is going on first hand at the events surrounding the Auction of Washington State Wines in mid August. One of the main events is the Picnic and Barrel auction at Chateau Ste. Michelle Winery. 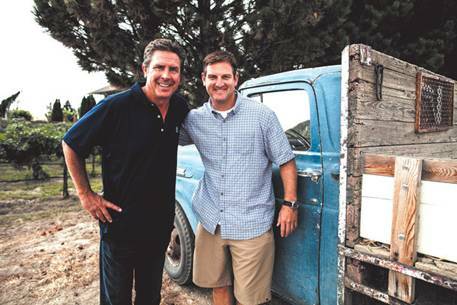 After seeing Damon Huard here the first two years that I attended this event I knew that he was serious about wine. Most great new producers start out as consumers and that is what it takes to make great wines, you have to know what great wines taste like. Operating a winery is another level and this requires a passion for the wine business and Damon seems to have both of these. 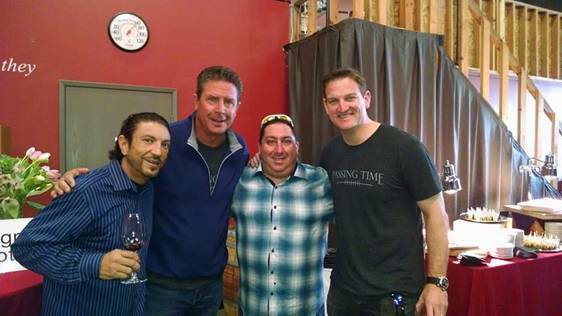 The third year at the auction our stop before the Washington Wine Auction Picnic was with Chris Peterson Winemaker/owner of Avenna Winery and Damon Huard the next celebrity winery owner in Washington State along with fellow NFL quarterback Dan Marino. They have a new project called Passing Time. Which has a dual meaning and although there is an element that refers to their carrier in football, it is not overdone and this wine is by no means marketed as a celebrity sports star wine. There is no mention of either of their names on the label just a decorative lace that appears to look like that of a football under the Passing Time name. Damon and Dan became good friends while playing in Miami and Dan brought Damon along not only on the football field but also in regards to fine wine. Dan is a big wine collector and was at one time Wine Watch's largest customer!! According to Damon, Dan was first to show the potential of his home states wines like; Quilceda Creek, Woodward Canyon and Leonetti Cellars. Although he grew up in Washington State Damon did not realize that this was also home to some of this country’s greatest vineyard sites. When Damon went back home to visit he made it a point to visit some of these top producers and to learn more about Washington's great vineyards. Damon found out that it was the quality of the grapes that determines the quality of the wine. He now has become an authority on Washington State’s top vineyard sites and after making friends with a few of these growers he has managed to secure some great fruit sources. The next piece in the puzzle was finding a top level winemaker like Chris Peterson and after 15 years in the making this 2015 vintage is the fourth release of Passing Time Cabernet Sauvignon (We have a few cases of this coming in the fall). It seems to have been worth the wait because the 2015 vintage SOLD OUT at the release party again this year in Washington. This is only the fourth release and already Passing Time has become an overnight success story. Chich went out to Woodinville to celebrate the release of the first vintage of Passing time with Dan and Damon. Black cherry, black raspberry, cassis, floral notes, and mocha on the nose. This wine is intensely structured and full bodied, with lively acidity. Red and blue fruits lead on the palate, with notes of cocoa, dried herbs, a hint of lavender, and fine-grained tannins on the long finish. A complex and pure expression of Walla Walla Cabernet, with just a hint of Old World savory complexity. Located on the southwest slope of Red Mountain, Klipsun Vineyard grows some of Washington's highest quality wine grapes. Named as one of the Top 25 Vineyards in the World by Wine & Spirits magazine, Klipsun grapes are used in many of Washington's premium wines. Cabernet Sauvignon, Malbec, Merlot are among the varieties grown on this 120 acre estate which was founded in 1982 by Patricia and David Gelles. Wine Watch Review: A great effort for their first Merlot which kind of happed by accident. When making the 2013 Passing time Blend after tasting through all the options with Merlot included they determined that this really did not add anything to the blend this year but by itself was a very impressive single varietal Merlot so they decided to bottle it as a single varietal. 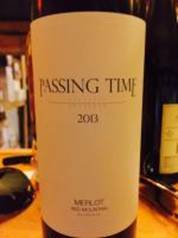 This 2013 Passing Time Merlot is just oozing with rich dark plum and cherry fruit with a soft plush texture and highlights of milk chocolate and sweet herbs, a firm hand of acidity holds everything firmly in place with fine silky tannins on the finish almost like velvet on your tongue. Finish 45+ Only 50 cases produced. MOST EXCELLENT TASTING DATE 08/18/16. This 2012 vintage is 15 years in the making and it was worth the wait because if this wine is any indication of things to come Passing Time will be an overnight success story.